It's the original game case and art. It has been used but in good condition. SUPER MARIO ODYSSEY - Nintendo Switch Game. Condition is like new. Shipped First Class USPS. Super Mario Odyssey for Nintendo Switch NEW & Sealed. New an unused. See photos for details. Super Mario Odyssey (Nintendo Switch, 2017). Condition is Very Good. Shipped with USPS. Super Mario Odyssey (Nintendo Switch, 2017) (Game Only) (0984-SM65). Condition is Good. Shipped with USPS Media Mail. Super Mario Odyssey (Nintendo Switch, 2017). Condition is Like New. Shipped with USPS First Class Package. Super Mario Odyssey Nintendo Switch Game, Perfect Condition, Includes Case! Super Mario Odyssey Nintendo Switch Game. Condition is Like New. Can ship USPS First Class or USPS Priority Mail. Select shipping method at checkout. This game is a total blast! I've put countless hours into it and am ready to finally move on to something else! 5 out of 5 stars - Super Mario Odyssey Nintendo Switch Game, Perfect Condition, Includes Case! 508 product ratings508 product ratings - Super Mario Odyssey Nintendo Switch Game, Perfect Condition, Includes Case! Super Mario Odyssey (Nintendo Switch, 2017). Condition is Like New. Shipped with USPS Priority Mail Small Flat Rate Box. Only played a few times game and case in great condition. Super Mario Odyssey Nintendo Switch - Settings Reset - Opened in Box. Condition is Very Good. Shipped with USPS First Class Package. Adult owned. Great game! Super Mario Odyssey (Nintendo Switch, 2017). Condition is Like New. Shipped with USPS First Class Package. Super Mario Odyssey (Nintendo Switch, 2017). Condition is Good. Shipped with USPS First Class Package. SUPER MARIO ODYSSEY. CLEAR CASE. Super Mario Odyssey (Nintendo Switch, 2017). Condition is Very Good. Shipped with USPS First Class Package. Zelda: Breath of the Wild Mario Odyssey (Switch). This includes the Mario Odyssey Traveler's Guide. Super Mario Odyssey (Nintendo Switch, 2017) (Game Only) No Case/Box. Condition is Like New. Shipped with USPS Priority Mail. Super Mario Odyssey (Nintendo Switch, 2017). Condition is Good. Shipped with USPS First Class Package. Game Does Not come with original case. Brand New, Never Opened Super Mario Odyssey Game for the Nintendo Switch. Condition is Brand New. Shipped with USPS First Class Package. Jump back into the fun of a favorite Nintendo series with Super Mario Odyssey for Nintendo Switch. Mario enters a 3-D world to save Princess Peach from Bowser yet again, and use new moves like cap jump to keep Mario one step ahead of trouble. Super Mario Odyssey (Nintendo Switch, 2017) NEW SEALED CASE DAMAGE DISCOUNTED ! 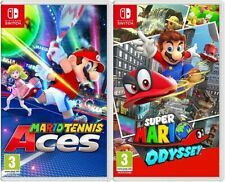 5 out of 5 stars - Super Mario Odyssey (Nintendo Switch, 2017) NEW SEALED CASE DAMAGE DISCOUNTED ! 508 product ratings508 product ratings - Super Mario Odyssey (Nintendo Switch, 2017) NEW SEALED CASE DAMAGE DISCOUNTED ! Super Mario Odyssey - game w/o case (Nintendo Switch, 2017). Condition is Good. Shipped with USPS First Class Package. 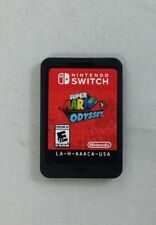 Imported from japan, this is a Mini game case for Super mario oddesy for the nintendo switch, its brand new and no it is not the game, only a case. Check out the pictures for size compareson. Also check out my other items i have more then just this game case, theyre also authentic nintendo! Mario Kart 8 Deluxe NBA 2K Playgrounds 2 (Switch). Used Nintendo Switch Super Mario Odyssey. Super Mario Odyssey (Nintendo Switch, 2017) FACTORY SEALED! FACTORY SEALED! We make an honest effort in describing each item to the best of our ability and knowledge base. 5 out of 5 stars - Super Mario Odyssey (Nintendo Switch, 2017) FACTORY SEALED! 508 product ratings508 product ratings - Super Mario Odyssey (Nintendo Switch, 2017) FACTORY SEALED! Super Mario Odyssey (Nintendo Switch) Case/Cover Only *NO GAME INCLUDED. Condition is Very Good. Shipped with USPS First Class Package. Smash Bros Ultimate Mario Kart 8 Deluxe (Switch). 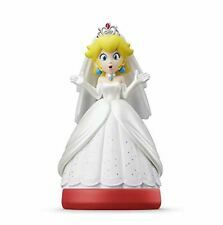 Super Mario Odyssey Game + Mario Amiibo Wedding + Case! Brand New Fast Shipping!